This is not exactly paintball, although in some ways this map can be so called. The goal of the game is to win over the opposing team, so the map is designed for a minimum of two players (the optimal number is four). There are two teams: blue and red. There is no paintball gun, you get paint balls instead of it, which does not kill players. The fact is that these paintballs will repaint the block that you hit and your color is deadly to the participants of the hostile team. So throw the balls under the enemy's feet and wait for him to die. 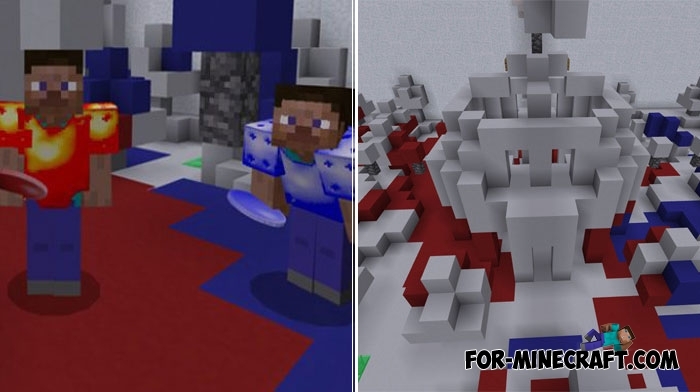 The principle of the game is similar to the spleef, but only the paint balls are your main weapon in the fight. And always be on guard, at any time the block under your feet can change color. Multilevel Spleef map for MCPE - BedrockThis is a great spleef if you want to have fun with your friends. Throw away your sword or bow on this map, you do not need..
SG Spleef map for MCPE 1.XSpleef is one of the best map genres for multiplayer games with friends or anyone you invite..